Only 13 days left* for your chance to bid for the one-of-a-kind Henry Repeating Arms 2015 Ford F-150 Lariat 4x4 SuperCrew® and Henry Big Boy Rifle .44 Mag w/ Custom Serial #... so what are you waiting for? The NRA Foundation is auctioning off a one-of-a-kind Henry Repeating Arms 2015 Ford F-150 Lariat 4x4 SuperCrew® custom wrapped by SkinzWraps of Dallas, Texas, on GunBroker.com. The auction is live at http://bit.ly/HenryFordTruck and will end on August 30 at 10:00PM EST, just in time for the lucky winner to enjoy the truck during hunting season. The winning bidder will also receive a Henry Big Boy rifle in .44 Mag customized with the serial number of their choice (maximum 12 digits, any mix of alpha/numeric, but must include at least one number). This luxury truck features an impressive 5.0L V8 FFV engine, the most fuel-efficient of any comparable V8, along with an electronic 6-speed automatic transmission with tow mode making the Lariat driving experience practical and powerful. The classic black leather trim interior with heated/cooled driver and passenger bucket seats creates the ideal comfort environment after a demanding day at work. The buyer of this vehicle will be as safe as they are comfortable with the upgraded technology package, which includes a lane-keeping assist and a 360-degree top-down camera display with dynamic hitch assist. A sport appearance package is also incorporated into this Lariat making it stylish without the flashiness. The 2-speed automatic 4WD optimizes traction by transferring power to the appropriate wheels when needed so the buyer of this truck can be confident even in tough situations. Be assured that the high-quality class IV trailer hitch and smart trailer tow connector will tow just about anything, while the rear view camera makes this truck not only functional, but indispensable. Safety doesn’t stop there with an advanced security pack that includes SecuriLock® passive anti-theft system and inclination/intrusion sensors. SkinzWraps added even more features to the already remarkable truck including a made in America TruckVault. 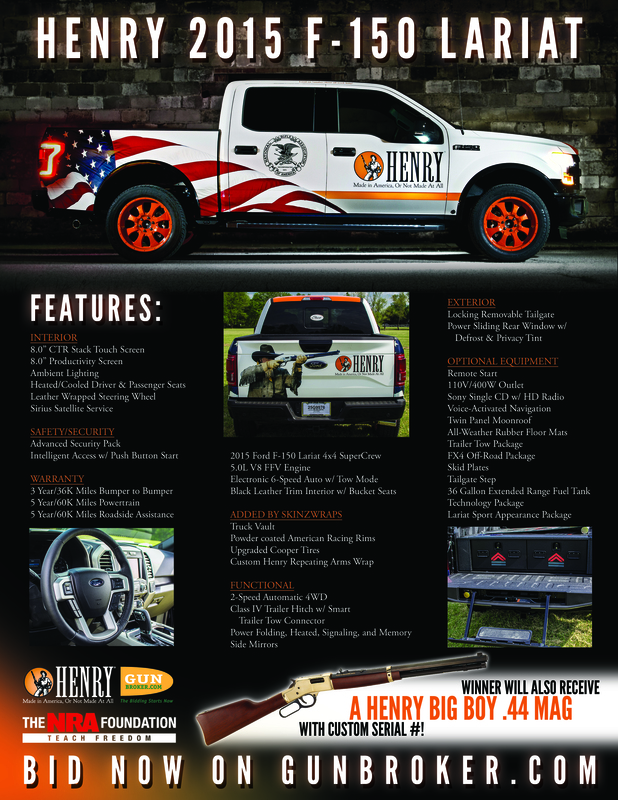 The most recognized name for vehicle equipment storage, the TruckVault is the perfect solution for storing your new Henry Big Boy and shooting accessories. Powder coated American racing rims and upgraded Cooper tires, along with artwork featuring Henry rifles, NRA and Americana images makes this the dream truck for patriotic Americans who want to display their Second Amendment freedoms with pride. The proceeds of the truck will support The NRA Foundation, the country’s leading charitable organization in support of the shooting sports. Foundation grants provide essential funding to ensure the availability of quality training and educational opportunities nationwide. Grants benefit programs such as youth and women education, hunter education, range conservation, firearms and marksmanship training and safety, and much more. Click here to view the flyer for this exciting auction. Then click here to view more photos and truck specs and to bid on this exclusive collector’s item at Gunbroker.com! To donate to The NRA Foundation please contact Megan McConnell at mmcconnell@nrahq.org or (703) 267-1417. *Auction ends August 30, 2015.